My friend Stephanie celebrated her 30th birthday last weekend and kicked off the day of festivities with a BBQ at her place. I asked what I could bring, and she put me in charge of bringing an appetizer of some sort. That left my options pretty wide open, so I decided to make something that I could also share on the blog. I've been wanting to do some sort of tuna tartare for awhile, and I felt like this was a perfect opportunity. 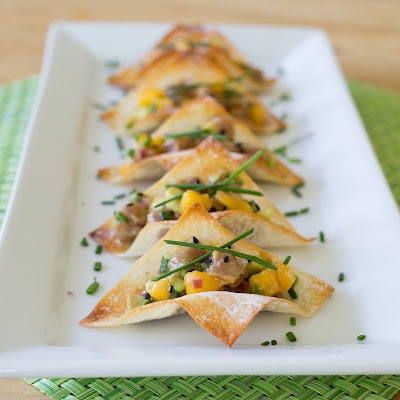 It's a nice appetizer for a hot day because it's served cold and is very light to contrast with the heavier BBQ fare. 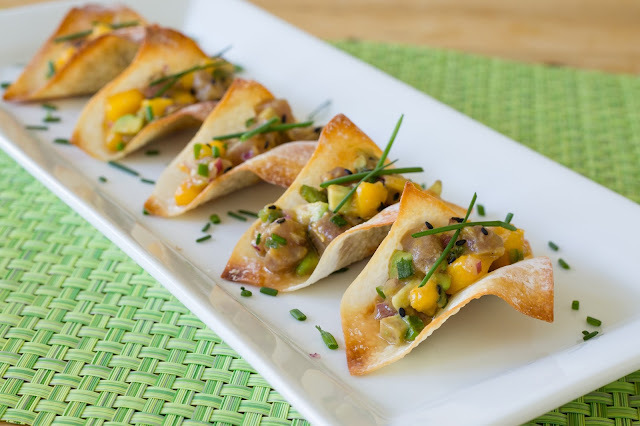 Plus... who doesn't love mini tacos of any sort?!? 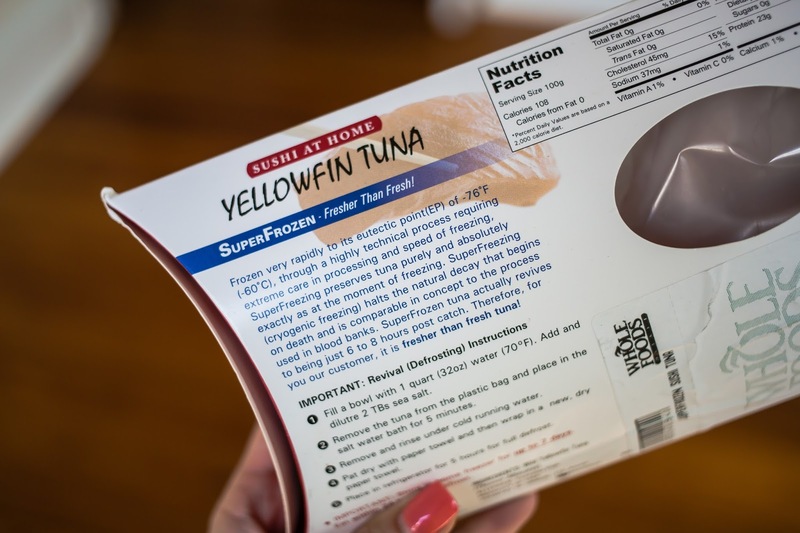 As for the tuna itself... make sure you buy a high-quality, sushi-grade piece of fish from a reputable place. I got mine at Whole Foods, and was surprised to see that it came frozen by design. Apparently it's frozen super rapidly to lock in the freshness... and according to the package, it's actually *fresher* than fresh. Who knows if that's for real, but after reading the package I was sold. It also came with very specific instructions for "reviving" the frozen fish. Also, it was really expensive... so keep that in mind if you plan to make this. I originally set out to do 6 or 8 ounces, but my only option was around 10 ounces (for $20). I think this recipe would work for anything between 6-10 ounces. (You will just have slightly different ratios of fish to the other ingredients). To make the "taco shells" I decided to go Asian-style and use wonton wrappers. You could certainly do tortillas if you want to make them gluten free... you will just need to cut them into small rounds or buy the street-taco size. If you are doing the wonton wrappers... I figured out this great trick for baking them into taco shapes. 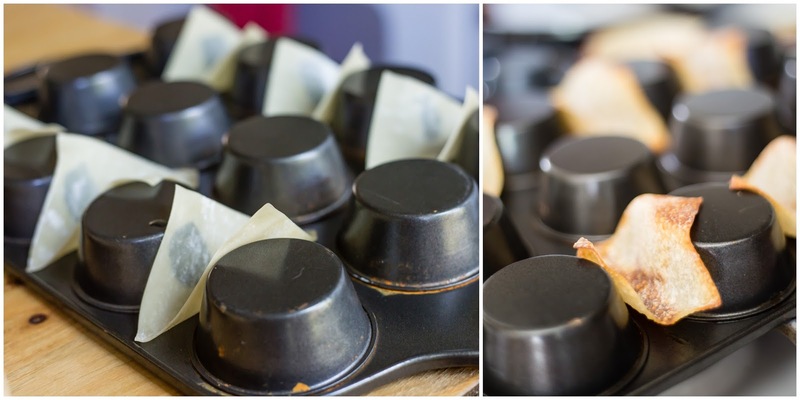 Just brush one side with a little oil and place oiled-side down in a muffin tin that's been flipped upside down. Nestle them in between the cups in a taco shape. Bake at 350 for 5-10 minutes, checking often, until lightly browned. (I found that the first batch took longer than subsequent batches since the pan was already hot). Repeat until you have about 20 shells. *You can certainly fry the shells as well, but I found this to be easier and healthier. As for the sauce, I did a mixture of soy sauce (sub tamari for gluten free), Sriracha, sesame oil, vinegar (not pictured), lime, grated ginger, and a little sugar. Honestly, the "hardest" part of this recipe is exercising patience when doing all the chopping to ensure you have uniform pieces of avocado, mango and tuna. Lightly toss everything in a bowl with the dressing and allow to marinate for at least 10 minutes. If serving immediately, just fill the shells and serve topped with chives. If you don't think people will eat right away... I would do what I did at the party and place the bowl of tuna mixture over a bowl of ice and serve the shells on the side for a "make your own taco" situation. What's your favorite BBQ appetizer? Share your ideas in the comment section below... I would love to hear them! 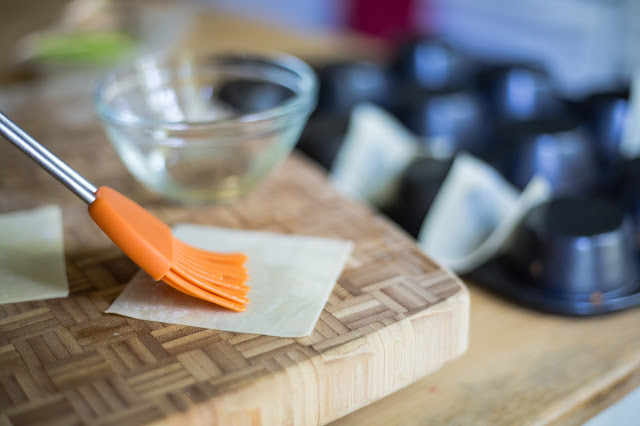 Brush one side of each wonton wrapper with a little oil and place oiled side down on the bottom part of a muffin pan that's been inverted. Nestle in between the inverted cups to make a taco shape. Bake for 5-10 minutes or until lightly browned, checking often. Remove and allow to cool. 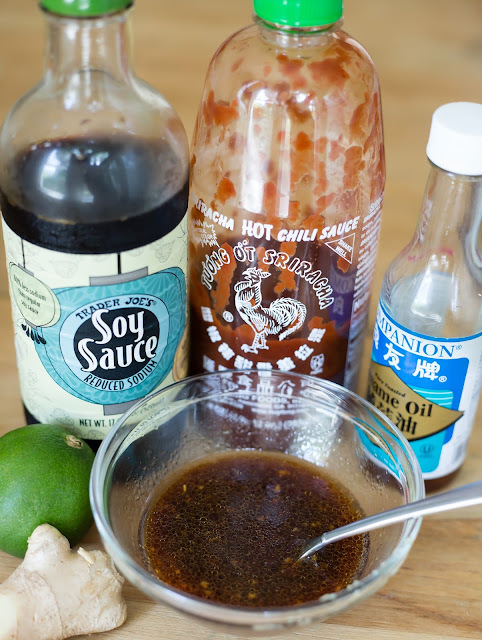 To make the marinade, whisk together all ingredients. Set aside. Once all of the taco ingredients are diced, lightly toss with the dressing in a large bowl. Allow to marinate for at least 10 minutes. When ready to serve, fill each taco and top with additional chives. (Alternately, you can set the filling over a bowl of ice with the taco shells on the side and allow people to make their own). Would stevia work as well? Speaking rationally ;) jalapenos? Otherwise, yum! Thanks!